Moving hand-by-hand with modern tendencies, various companies are seriously oriented on creating more “waste-free” products. Fortunately, it gives rise to the greater quantity of brand identity designs, which consequently provides us with more reasons to rejoice! I personally adore ingenious illustrations more than anything else, so it’s the second time in a couple of months I get that excited to discover some thoroughly-made coherent visualisation (the first time is marked by the article about Ouch! illustrations). 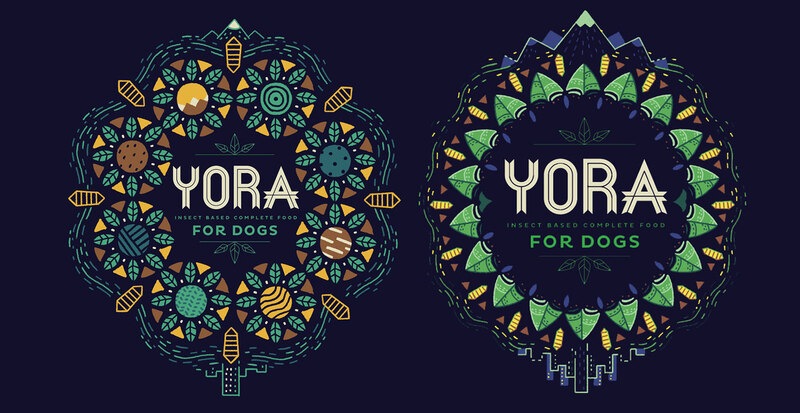 Today’s dose of inspiration comes from the YORA Pet Foods project, blessed with adorable animated illustrations by Yukai Du. Before jumping into the topic, let me put a light on the brand itself, I bet you’ll find it at least educating to get acquainted with. YORA comes from the name of the last detached from civilization tribes in the Amazonian rainforest. Such symbolism is connected with the concept of leaving the smallest eco trace on our planet and reducing the worldwide pollution. The company has launched a brand new vision of dog food by producing it (here it goes) from insects! On their website, the creators give sufficiently convincing reasons for replacing meat products with nutritious insects, containing even more energy value. Don’t deny that you’ve caught these Hakuna Matata vibes already. Even such a broad and rich in allusions concept can’t make us get carried away from the brand identity design. Colorful visions smoothly change one another in the ongoing animations, which you watch over and over again and can’t stop. And of course, the multitude of elements scattered around each scene get noticed only after a couple of views. The “crafty noise” made by hand-drawn grain textures appears as something native and cozy, situated on the same page with the audience. By choosing restrained shades, the author skilfully combines them with each other so as the result is showy after all. Also, don’t forget to check out the video, made with the support of Bliink Animation Studio. Less agitating that a usual ecology-propaganda video and is something more than just a brand identity commercial.